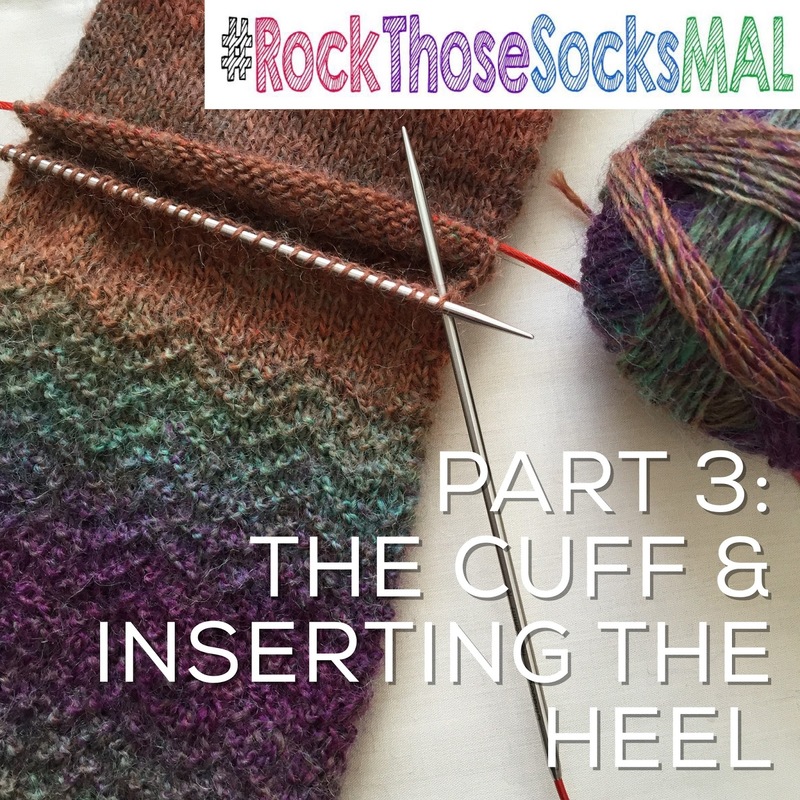 This post is the final instalment of the Rock Those Socks Make-along knitting pattern. Find the third part of the crochet sock pattern on Maria's blog here, and earlier posts in this series here. Last week I left you to finish the patterned section of the leg, so it's time to knit the cuff and insert the heel to get a finished sock! - Kitchener stitch / grafting. 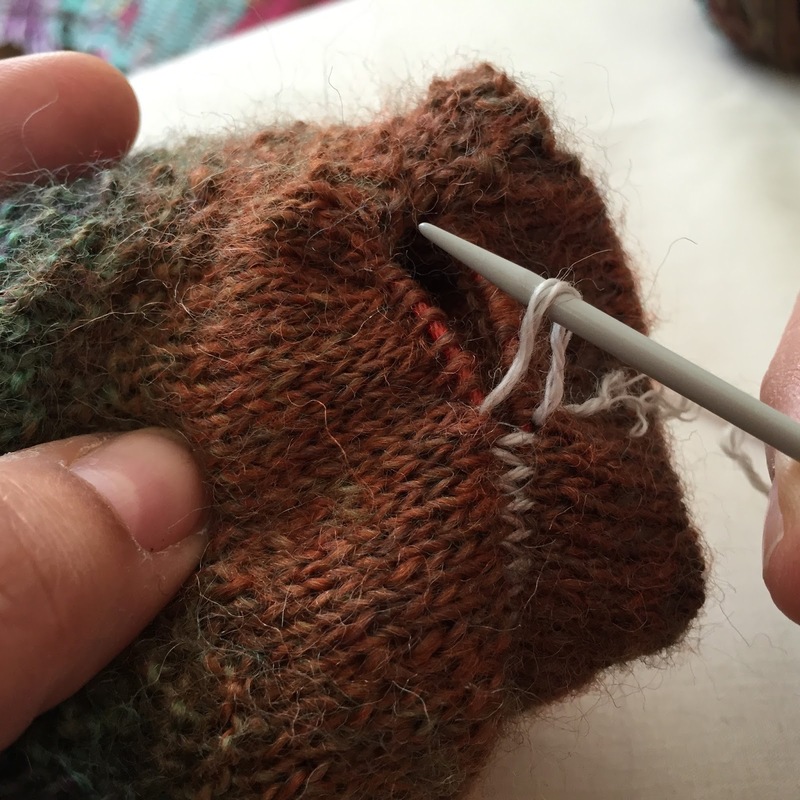 Written instructions are provided, but you might like this free online class 'Ins and Outs of Grafting' in which Anne Hanson shows exactly how it's done or if you work better from photos, try this Knitty tutorial. Note that numbering is continued from the previous posts. 12. When the desired cuff length is reached, bind off all stitches loosely. If you are not able to bind off loosely using your regular sock needles, you may like to try a sewn bind off (tutorial), a crochet bind off (tutorial) or to use bigger needles. Once the cuff is finished, you are ready to insert the afterthought heel. 13. This is the fiddly bit so take your time and start by turning the sock inside out. Between the 'scrap' yarn place-holder, you'll see two rows of purl stitches. Use your empty needle to carefully pick up one of the rows. As pictured below, don't worry if you pick the stitches up 'backwards' - I find it easier and more natural to do this, and to untwist the stitches on the next round of knitting - easy! 14. When you've picked up the correct number of stitches from one side of the place-holder (half the total = 32 stitches, if you're following the pattern), repeat the process with the other needle tip and the other row of stitches, until all stitches (64) are on your needles. 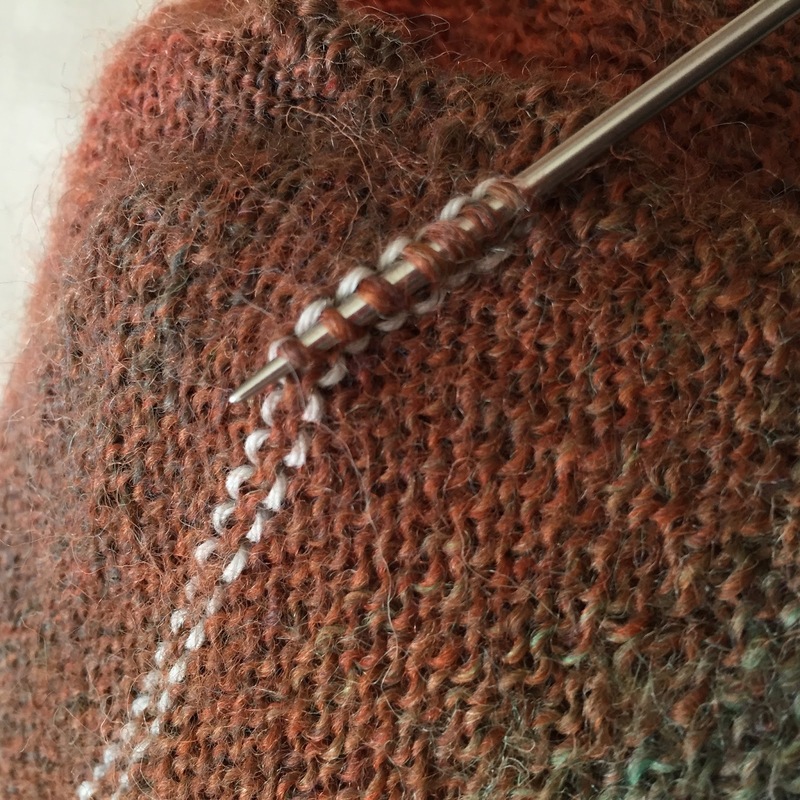 Note that it is quite common to pick up an extra stitch at either side - don't worry if you do this, you're about to decrease anyway so it's easily fixed. All stitches back on the needles - don't worry too much about their direction! 16. 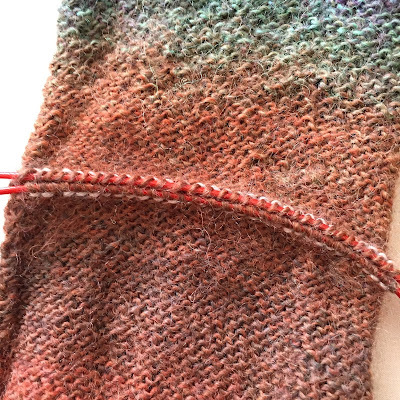 With the scrap yarn removed, turn the sock so that the right-side is facing out, and put the needles through the opening, ready to knit the heel. At this point you should try the socks on. If (like mine) the sock is snug and only your heel is showing, you're ready to work the "afterthought" section. 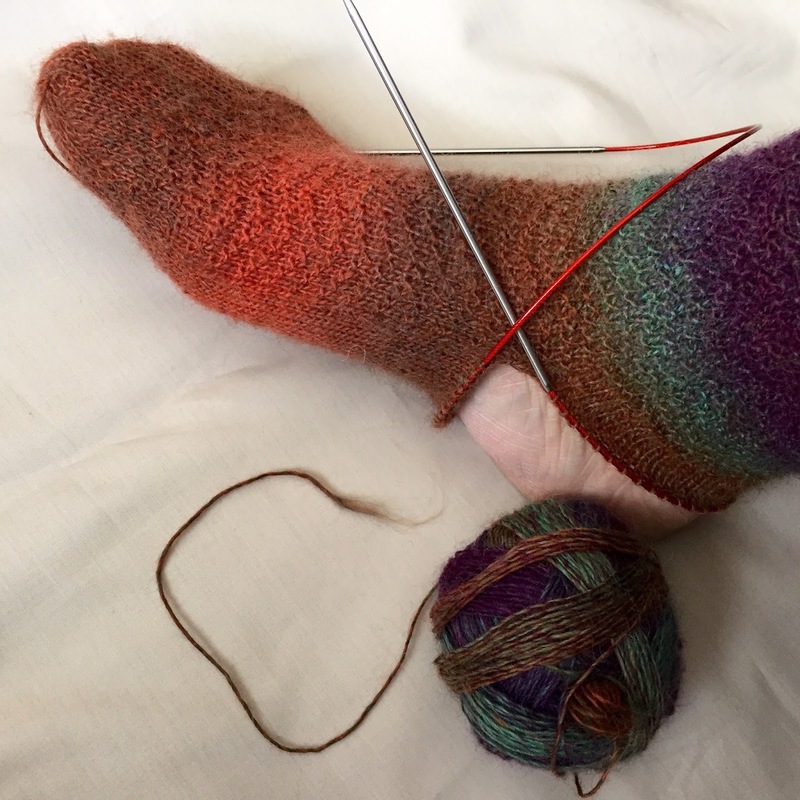 If your sock is looking a bit too small, you will have the opportunity to add a few rounds of plain knitting before decreasing for the heel at the end of step 17. Try your sock on before decreasing! REPEAT steps (a) to (d) until all the stitches are bound off. 20. 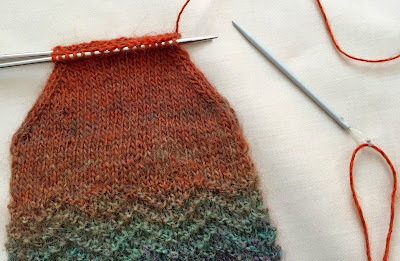 Sew in all ends for a finished sock. 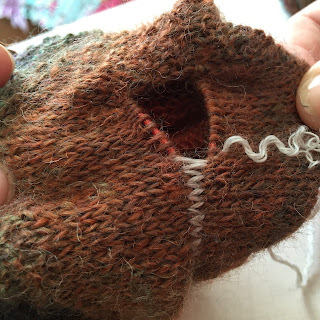 (If you still have a little gap where you picked up stitches for the heel, sew that closed too). The pictured sock blocker is bigger than my foot, but easier to photograph! With all three parts of the pattern, you will now be able to get your knitted socks finished before the weekend! Don't forget to link up to the Ravelry page, and to tag any social media posts with #RockThoseSocksMAL. NEXT WEEK I'll be back with a summary of the entire pattern in PDF format, so you can download it to your device or print it off for quick reference. In the meantime, if you're enjoying this series, you might also like to check out my other tutorials and patterns. Oh I'm so excited, I can't decide whether to finish working up my second sock or put those stitches on scrap yarn and transfer back to my first sock so that I can finish one today! I love the afterthought heel idea, I have some handspun I want to use for socks but was worried about them wearing too quickly. 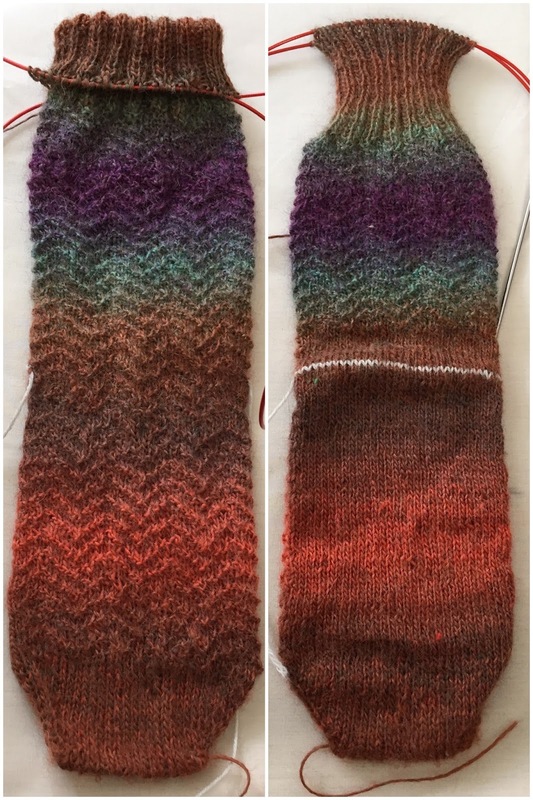 With this pattern I know I can just knit new heels ( and toes ) as I need to. I love this construction for the same reason - I always wear through my heels! Of course you can use reinforcing thread too, for those bits!!! Yay! So happy to have helped. Sometimes we can get a mental block about thigs...I'm a bit like that about writing crochet patterns! Oh no! I've just tried my sock on before knitting the heel and I've made the foot too big! Is there anything I can do? (Ripping back is not an option - I'm a 'bodge it' type of girl!). If I knit the heel as it is the sock will be wearable but not snug. Yes, provided it's not enormous (if it is, maybe gift them?). THE BODGE: When decreasing, decrease faster (every row) or decrease to not so few sts (eg to 20). Either way you'll end up with a smaller heel and more of a snug sock than working the full heel. Hope that helps! Yay fantastic, thank you for such a quick reply. 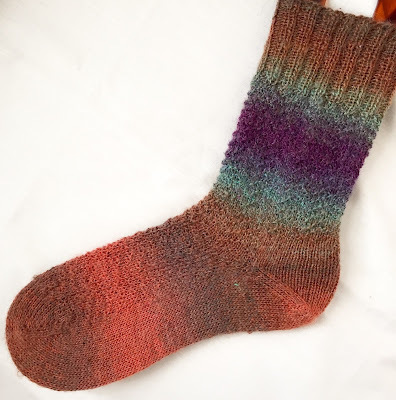 All done and feels amazing (nothing feels quite like wearing hand-knit socks). I'll put a picture on your Facebook page.